If I believe life is defined more by its journey than its destination, and I do, I must also believe it never stops moving. It never stops changing. This is scary in some ways; perhaps it means we never own a thing in life – like hope or success. But it is also welcome in other ways; maybe nothing ever owns us either – like fear or failure. Last winter I gained too much weight. Used to be I never would admit that. 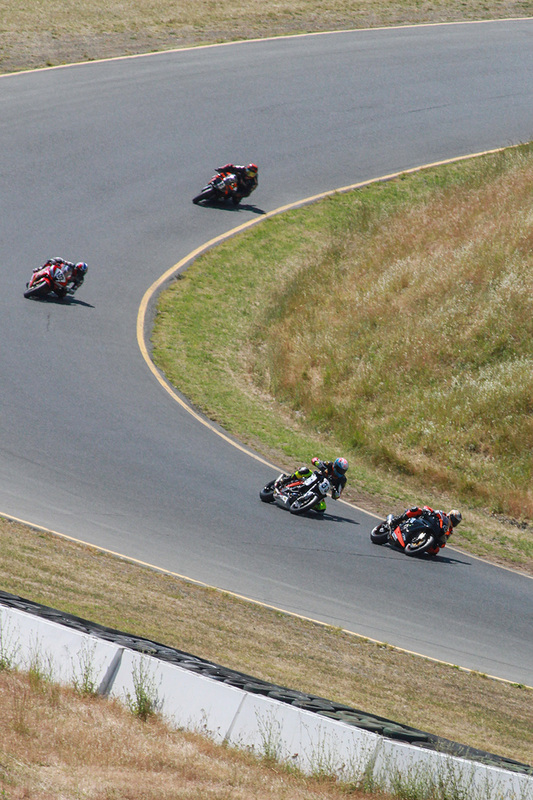 We used a crowbar to get my Vansons on at Thunderhill. I cut my back protector in half and I still couldn’t breathe in my leathers. It took me months to recover from that shameful time that I now refer to as my low, and I’m scared as hell to go back there. So scared in fact that I eat Kale for breakfast now, and it’s disgusting. I curse carrots as I strip the dirty skin from their backs. I talk to myself, literally, as I load fist-fulls of spinach into our blender. “Why would you ever eat crap like this on purpose?” I say. Well, for me, racing is why. Still it is one of the stronger driving forces in my life. Still it is what makes me want to be better, tomorrow, than I am today. So much better in fact that not only will I endure pain, but I will actively seek it out. For years I helped Tracy raise her only son Matthew. I know I did my best, I’m just not sure my best was great. If I could go back and do it all again I would abandon all of my lessons but one, and every day I would teach him the very same thing – that you can make a difference, that you can make things better. That I chose a KTM Superduke to race this season, against the most potent superbikes made today, might confuse you if my goal is to win. And my goal is to win. The 1290 is not the most powerful bike for sale, nor is it the lightest or does it come with the best components. You won’t ever see one raced in World Superbike, in fact you might never see one raced at all. But this bike does have more of one component, for me, than any other bike on the market today – opportunity – and here is my proof: My first day in California I quickly learned two new names, “AFM” and “Dave Stanton”. In almost all the years since then, Stanton either won or was in the hunt to win – a race, a championship or the number one plate in Formula Pacific. If we ran with the AMA, Stanton out-qualified me. If we stood on a podium together, Stanton stood higher. If we stood in a crowd together, Stanton drew the laughs. I always did and I always will look up to Dave, and anyone around him. And the one guy who I saw around him more than anyone, was a medium height serious but almost always smiling mustached guy named Kenny Norman. If I’ve heard Dave’s name a thousand times since I moved here, I’ve heard Kenny’s nine hundred. For as long as I’ve looked up to Dave, and for all the reasons, Kenny played a major part in a lot of them. 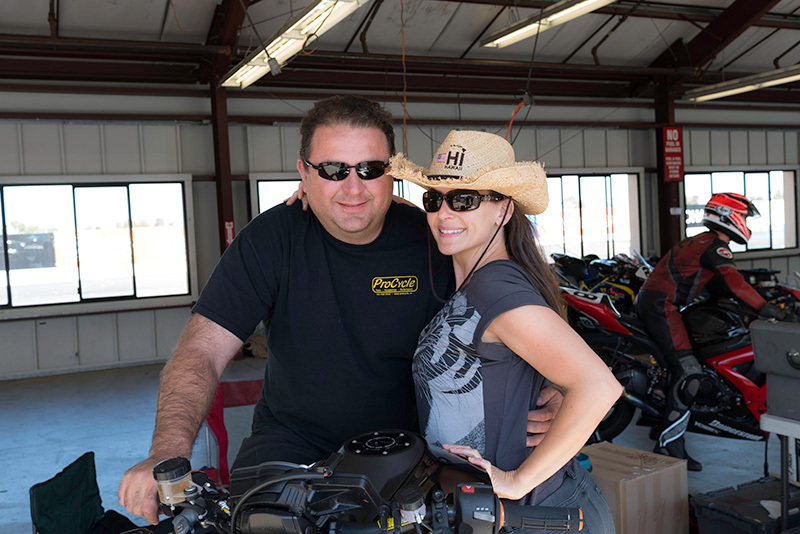 When I showed up to Buttonwillow’s round-1 late Saturday morning our new Superduke was just two days old. I had spent those first two days working feverishly at CalMoto race-prepping it the best I could, but I failed to finish. So there I was, tools and parts scattered on the floor next to a bike half built with the hope that I’d make Sunday’s race running swiftly through my fingers. Then suddenly no one other than Kenny Norman himself crept around the front tire of our Superduke and with cautious enthusiasm, introduced himself. About four minutes after he reached to shake my hand, he reached for a wrench and offered help. I know, at least initially, that the curious draw of a roadracing Superduke is what drew Kenny in. Three key things happened for us in that first round; We did make the Sunday morning warm-up, with just six laps of practice we took a second place in Open Twins, and Kenny Norman actually played a cameo role as our Superduke’s crew-chief (only none of it happened in that order..). I mirrored Kenny’s cautious enthusiasm over the following days, in asking him what it would take for us to work together this year because not only can’t I do all this by myself, quite honestly I don’t want to. 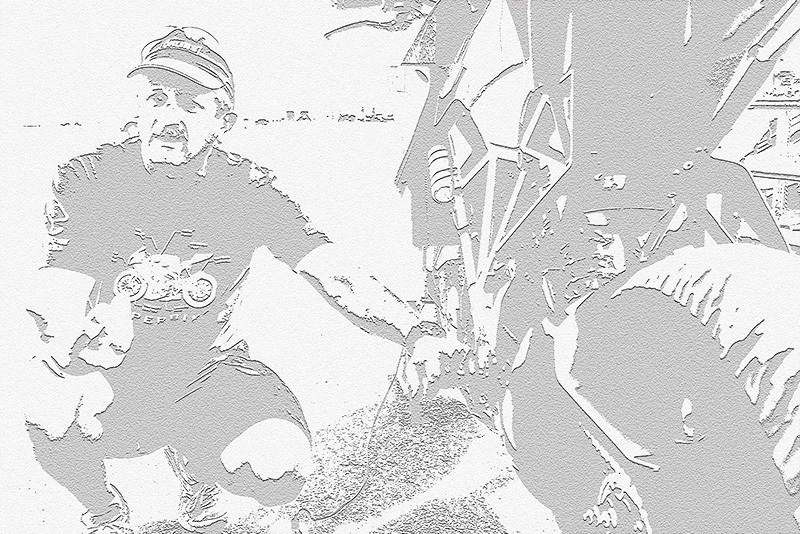 Not because I am lazy, but because racing for me – like life – is far more about the journey than it is the destination. Far more about its people than its prize. Kenny answered me two ways; one with words, the other with pauses between his words. This is a language I have come to respect. It means don’t ask again. Don’t force. Do good and good will take it’s shape. The last thing Kenny and I did together at Buttonwillow was give the bike to Barry of KFG Racing, to take with him back to Washington. In the month’s time between round-1 and round-2 our forks would be transformed from basic street forks with barely any adjustment, to proper roadrace forks with the endless adjustability of his GP Suspension Cartridge Kit. Before he installed them though, he had to design and build the cartridge kits to fit a 1290 KTM Superduke. 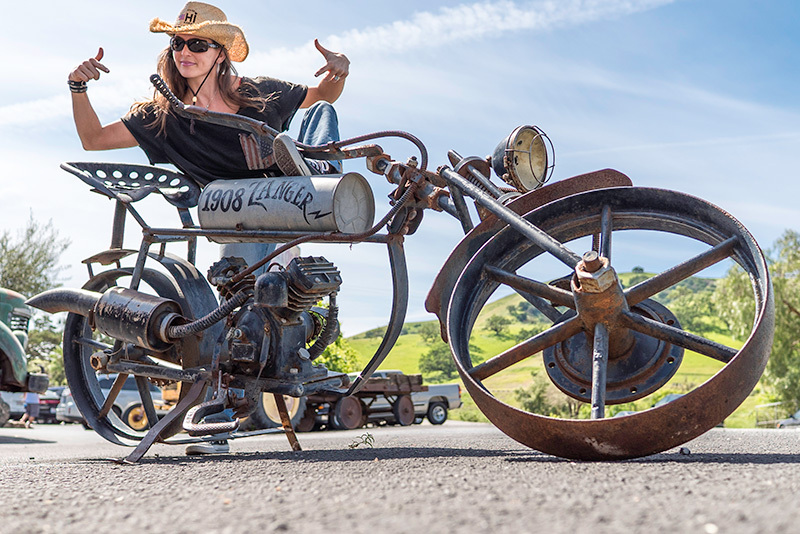 That sounds easy enough from two states away, but I know the world of building things rather well, there are countless hours involved in turning the words “Cartridge kit” into finely machined aluminum bits that bolt straight onto your Superduke. In the final days leading up to round-2 last week, I grew more and more uncomfortable about not receiving word that our forks were done. Three days left, two days left, six hours left and still no word. Being inherently superstitious, and now consumed with doubt, I was now on high alert as I pushed my cart around Home Depot finishing my last errands before leaving for the track. As I headed for the register I noticed how conveniently the flowers I picked out for Tracy were hiding those two over-priced battery packs I had thrown in before them. At the register I did my best impression of a guy completely innocent, as the girl checked me out. She never saw the batteries. I calmly pushed my cart full of flowers toward the van as every so gradually my innocence turned to guilt, which once mixed with superstition turned to complete paranoia. In fifty yards I had convinced myself that those two battery packs would represent the turning point for our round-2. The moment it all would turn bad. Karma is no toy, so in a huff I turned around and walked back to the register. I told the girl I never paid for the batteries and handed her my card. She beamed with compliments of my generosity. I confessed to her that generosity had nothing to do with it, and shamefully I walked out. But at least I saved the weekend. Do good and good will take it’s shape, right…? Before I even made it back to the van my phone rang out showing Barry’s number. I anxiously answered figuring this was the fastest payback of a good deed ever rendered. Nothing doing, his defeated tone was all I needed to hear. I knew our forks never got built before he spoke the words. Bad news turned to worse though, when he told me the Bazzaz equipment I mailed him the week before had rendered our bike spark-less. In a month’s time we had gone from a bike with no suspension to a bike with no suspension, that didn’t run. I turned to those double-crossing batteries lying on the passenger seat next to me, looking like they had nothing to do with any of this, and asked, “Is this just the beginning of the crap this weekend, or will there be more?” They sat there looking completely innocent. I can fumble my way through a bike with my old wrenches. I can fix bent brackets, I can change wheels, I can bolt new parts together. But I have no business valving forks or plugging laptops into motorcycles. I am at the mercy of my heroes here, and my heroes came through big time this weekend. They rescued us from failure’s grasp, again. Some time around 2am Saturday morning, Alex Torres of Fastline helped Barry sort out the Bazzaz install. Two confusing wires had been crossed. The bike now ran again. An hour after sunrise Kenny Norman had reappeared as head of our Superduke’s race prep. 11am Saturday morning Eric Dorn of EDR Performance took our Bazzaz system a step farther by manipulating its fueling map so the bike would accelerate past 6000rpm. Karma had turned its kinder face and I didn’t deserve any of it. Although I have great respect for Eric Dorn and his engine building accomplishments, I barely know him. Yet there he and his mechanic Donte were helping us, just because. CalMoto, after all these years, still supporting our fight is a testament of their character. Alex Torres working on our bike at 2am is something I still can’t wrap my head around. Kenny Norman just introducing himself never mind becoming a part of my struggling program, and Barry Wressel taking on a project of such magnitude… These things I fear I do not deserve. I can’t pay them back because the value they create is greater than any of them understand. The best I can do in return I think is not be a jerk, and ride like the wind. The race got red-flagged. We were sent back to the garages. Once there I theorized with Kenny and Alex Florea about our suspension. The bike feels hard to me in the back, and super soft up front. Riding a bike so out of balance is very challenging, and always slow. It feels like two different bikes – one going in, on the brakes, another one coming out, on the gas. And then there are the fast sweeping turns. I think those are the worst to endure with such a poor setup. Since our forks couldn’t go stiffer without Barry’s cartridge kit, we simply screwed our compression and rebound to their stops. No adjustments – valving fully closed, and no spring preload adjustment offered. From here I decided to make the rear softer, to match our soft forks, to gain balance. But after just two turns into the re-start of the F-40 race I knew I had made a huge mistake. I had gotten another great launch, but this time just to third place. I was not comfortable though, something was very wrong. Now the rear of the bike simply crumbled under the force of acceleration and turning. I thought about pulling off but I knew we still had our Ace of Spades to play, which I have yet to mention.. I have run Michelin tires exclusively since late 2008. Before then I ran Michelin tires from 1992 to 2000. I know them well. There have been times over the years when Michelin’s advantages were hard to overcome in roadracing. As well, there have been times when you had to work harder to find them. Remember, life is in motion, it is always changing. 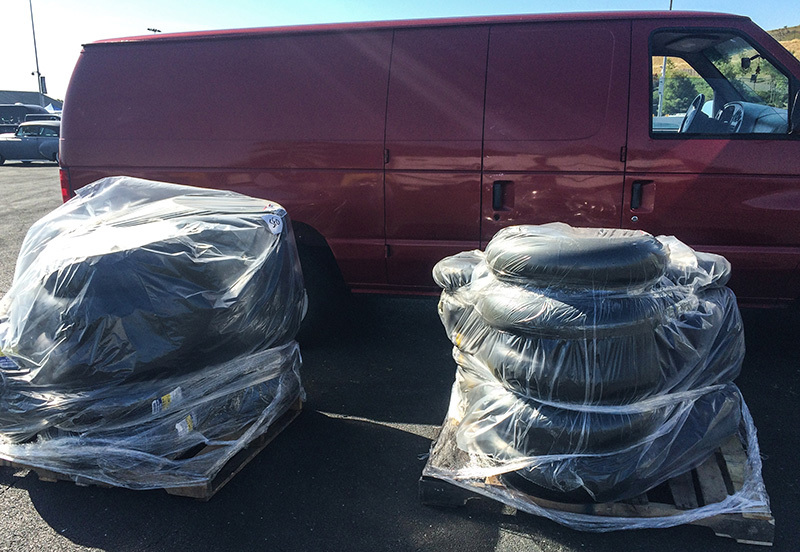 When single tire rules became fashionable in professional roadracing, we all lost something. 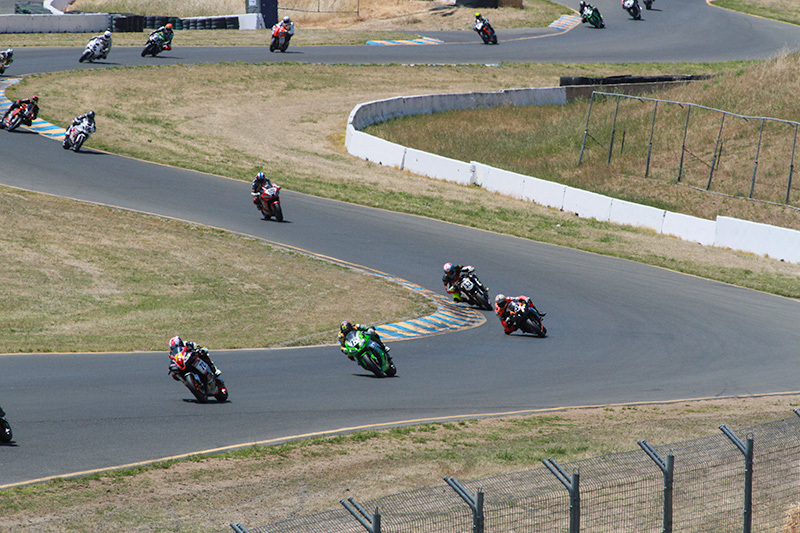 Competition makes everyone better – racers, bikes, even tire manufacturers. So what’s our Ace of Spades then? Think about it – who is one of the best development riders of this decade and last? Your answer is Colin Edwards. Who does Colin work for since he retired from MotoGP? One of your answers is Michelin. Who is the official tire supplier of MotoGP starting the day after Valencia this coming November? And what size will the tires be? Your answer is Michelin, and the size is, your size. OK questions are annoying so here is your last one: What was on those two palates parked outside my truck Friday afternoon? As bad as our bike was setup this weekend, as wrong as my decisions were which made it even worse, our grip was exceptional. The new EVO tires are very different. Not just in their grip but in their shape as well, which affects how the bike reacts as you turn-in, as you turn from left to right and back again, and most of all in how you drive out of a turn. I used to make up for our horsepower disadvantages by getting the holeshot and running away as early as I could in races, then trying to maintain our advantage as the tires gradually faded. This weekend, on the EVO tires, our advantage never faded. In fact I ran all day long on the very same EVO tires that we raced Forumla-40 with at the end of Saturday – and we ran every lap of five hard practices before that race. It took me a couple of laps to make it up to our old RC8R again. James was riding consistent and fast. 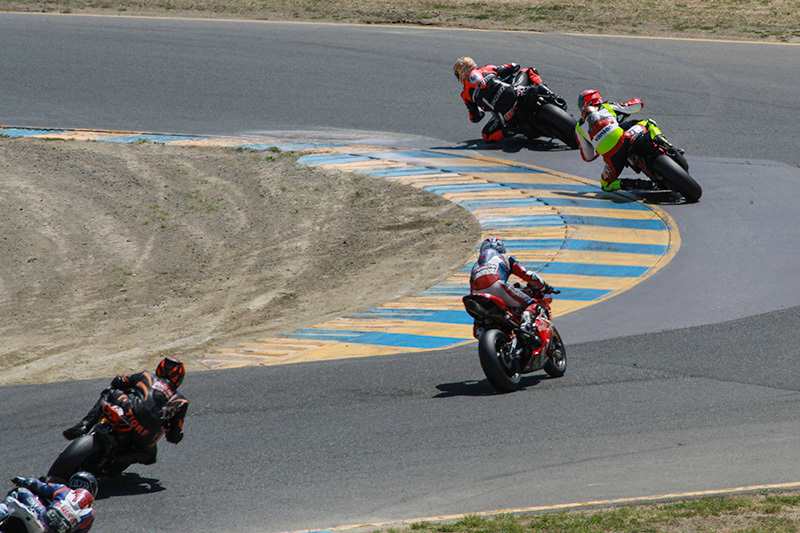 Our Superduke turns in a very short radius so I was able to tuck up under James through turn 7. From there I ran as best I could but our bike was a handful setup how it was, I couldn’t get away clean. Kenny’s signals kept telling me James was up our tailpipe on the front straight. He even muscled his way past us on the last lap but we fought back and took the checker, for what I have been told is the EVO’s first win in the US. Well what do you know about that – from a bike that didn’t run, to the first checkered flag – all in the span of just 14hrs. I entered us in three races Sunday. I never do this. Racing this Superduke is exhilarating. I have missed it so much since our 990 Superduke was wrecked in the crash with Jamie Keating back in 2010. Open GP came first. Again we started from far back on the grid, and again I did not mind at all. We put our rear shock back to firm and ran as best we could like that. Surprisingly we came in 5th I think, or 4th, comfortably ahead of Tiger Boy on his Panigale. That was a good sign for the future, being that he is right now our toughest competitor in Open Twins. But I knew not to take that micro victory seriously. He typically races his fastest with the two names, “GoGo” and “Open Twins” glued to his windscreen. In Formula Pacific they started us on the third row, 12th, which was actually nice. Not being last on the FP grid meant we must have made a timed-Saturday practice for a change. That’s the kind of progress you need to credit Kenny Norman with, and Alex Torres, Barry Wressell, Eric Dorn, Donte and big Mike. We hung tough from 12th or so, made it up to seventh I think, and once again got stuck behind none other than Jason Lauritzen. Although his bike and leathers are now a different color, this place is very familiar to me. I found myself there four times last year, and only made it past the one time he made a mistake. This time I had his pace comfortably, which was surprising. I think its because he was hurt. Slowly though, our rear shock started to fade. That pace crushing collapse of the rear seat falling to the pavement really hurts drives out of turns. Later we learned it’s the shock oil that broke down. I should have serviced it, that shock was stolen from the wrecked 990 Superduke which has been sitting since 2010.. That’s some old oil.. We ended up 9th. 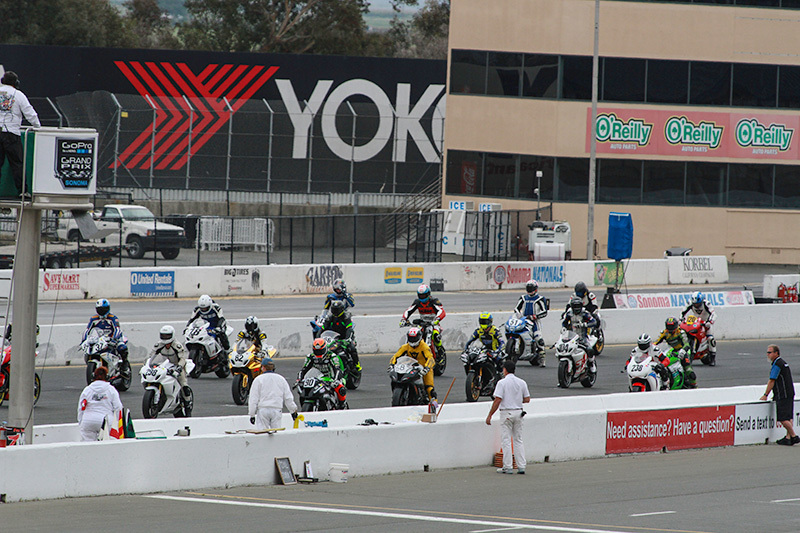 We took the holeshot in Open Twins and lead three laps. They were sloppy laps, we have far to go developing this Superduke. Tiger Boy came by and I couldn’t fight our way back. He and Brian took a well-deserved win, but we were surprisingly close. The good news is we are not as far off the pace as I expected us to be at this point – maybe just a second now, and I know we have more than that on tap. I really thought a win on this 1290 Superduke was an irresponsible dream of mine to have. I don’t feel that way now. We can win on this bike. We just need to do better. We need to be better. All of us. And we will be. If you are lucky you learn from life’s mistakes. If you are strong, you pick up where you dropped the ball and begin to run again. Life is in continual motion. It is defined more by it’s journey than it’s destination. So if you don’t like who you are or where you are, today, go ahead and make that difference – because you can.